Non-financial disintermediation using blockchain or distributed ledger technologies may be imminent. Take the car industry as an example, along with one would-be player, PowerBand. 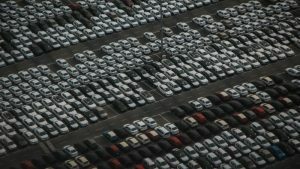 Little by little new technologies are coming to the US$2 trillion automotive industry in a big way – and that may include car selling and blockchain. In 2017, 94.5 million cars were sold world-wide. In theory, If one forgets self-driven vehicles, everyone wants to buy a car. But nobody likes to buy a car. Why should they? Current processes are inefficient, unnecessarily expensive and time consuming. At least one company (there are other varieties) is using new technology to try to remove the middle man. It believes there is a potential to create new profits for the automotive industry. As PowerBand Solutions (PowerBand) might put it: why should the middle men get the money, when the automotive industry itself can capture more profits if it used the right technology? PowerBand is adapting a cutting-edge tech to automotive sales. In addition, it has signed up some of the biggest partners in the US. These partnerships include auto dealers and cooperation with firms like Route One, PBS, Quantech, Dealer Socket and more. underpin a profit margin of as high as 69% on certain vehicles. The auto industry is an international behemoth, and demand is still rising. The biggest auto companies – Toyota, Volkswagen, General Motors and Fiat Chrysler – report billions of either profits or losses each year. In the United States alone, customers bought 5M new and 12M used cars in 2017. Inside these sales there is much waste. Middlemen – third party resellers, large auctions, etc – siphon billions off the market in hidden fees. This produces higher costs for all. Potentially, according to PowerBand, there is around US$1000 per vehicle up for grabs. That is $17B/year, a substantial opportunity. Where do these costs arise? Some are fees necessary for dealers to cover the cost of processing purchases. That is because most dealers still prefer pen-and-paper contracts, with numerous long pages. Such fees have nothing to do with the value of the car. Instead, they pay for admin and advertising plus each car’s documentation fee. These can range from, in the US, $75 in Oregon to $799 in Florida. On average the document fee is $400 per sale. Sometimes this is negotiable – because it is just an added fee dealers tack on to cover costs. In other cases, the fees are non-negotiable. Dealers won’t budge if consumers try to talk them down to a lower fee. The result is that the ‘document fee’ can add anywhere generally between $400 and $1000 to the price of a car, though it can be more or less. A technological solution and non-financial disintermedition? PowerBand wishes to streamline the whole auto purchase process by applying technology. By cutting out added costs, eliminating administrative waste and removing the need for added fees, the Powerband auction software platform will assist dealers and OEM to sell through its buying network. This would take head-on the $100B auto-auction industry. The PowerBand software allows for faster, easier auto purchases through on-line auctions. These are relevant to individual buyers and sellers, dealers, rental car companies and fleet purchasers. The business model is transaction-based, with a charges of $200 fee to buyers and sellers who utilise the platform (rather less than the traditional $400-$1000 auction houses usually charge). PowerBand is also mastering information control. The company claims to have developed a standardized electronic appraisal system, one that provides up-to-date information on cars. The point of this is to increase transparency. And here is the potentially neat part. PowerBand intends to apply blockchain technology to its platform. Use of blockchain is intended to help certify non-financial data – vehicle history, financing, mileage, servicing, accidents and more. In other words, each car comes with an unalterable documentation provenance before it sells. As each car proceeds through owners and experiences (services, accidents, registration, ownerships, etc), an addition is made to the blockchain. The US auto selling and reselling industry is famously inefficient and well protected by state laws (think of Tesla and its sell direct travails with Michigan). There is much inertia. To date Powerband’s presence is minimal. It hopes to grow to take 2% of the vehicle automation market, which would seem achievable. But the bigger point is less about the auto industry and improving documentation fee charges, which is PowerBand’s focus, and more about record keeping. Just as with healthcare, where logic says it makes most sense to keep medical records with the patient who is the one needing treatment, so it could be with cars: keep the record with the vehicle. Arguably most manufacturers do this, on existing systems. If you have (say) an Audi or VW, and you service it at approved dealers, there is a complete manufacturing through servicing record. But try to obtain a copy of this if you are selling your car? Forget it. It belongs to the manufacturer, not the car owner. All of which brings tantalisingly close a more logical, less externally controlled future. Non-financial disintermediation using blockchain technology would be more than that expected in a financial sense. Bothered by missing out on the Bitcoin run-up?